In 2016, Instagram started taking on rival Snapchat with Instagram Stories. The feature has since taken off and is now growing in ways that clearly mark its territory. What started out as a knock-off is now maturing into a channel of its own. This past January, Instagram Stories Ads launched privately with 30 brands like Nike, Netflix and Airbnb. Then in March, they opened that program up to sellers of all sizes. 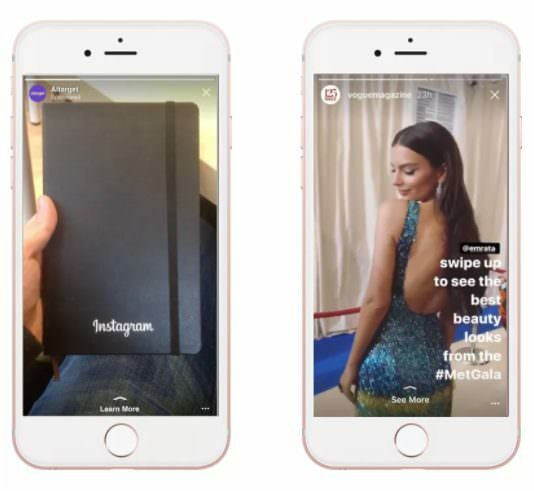 Instagram Stories Ads provide you with a unique and new way engage with your customers and target market. Let’s take a look at what they are and how you can use them to develop your brand. For those on a social media diet, Instagram Stories are 24-hour, self-destructing video and photo streams, similar to Snapchat stories. They started appearing at the top of Instagram feeds last year. Once a user starts watching the stories of the people they follow, the videos automatically play one after another until they’re all caught up or decide to swipe out. The ad can be composed of either a single photo or video up to 15 seconds long and can be used to target various business objectives, from brand awareness to website sales. It’s the first time that Instagram has provided advertisers with the ability to display full-screen advertisements inside the app, giving you a chance to hold the user’s entire active focus, even if just for a moment. However, you pay a price for that attention. Like any Instagram story, ads are easily skippable with a tap on the screen. In order to take advantage of your placement, you’ll need to create a compelling and attention-grabbing advertisement. Free Bonus Download:Get our list of 29 growth hacking quick wins you can use to grow your business! Click here to download now. It’s important that you catch the viewer’s attention immediately. To create a strong impression quickly, make sure that you only use high-quality media whether you opt for photo or video. Photo ads only last 10 seconds and video ads last up to 15 seconds. Users won’t be able to return to them later, so it’s important that they grasp the message of your ad in the first few seconds so they can decide to take action or follow up for more information immediately after. If you decide to try a photo ad, make sure that you use a bright, bold photo with clear branding and simple messaging. The user should know who you are, what you do, and how you can help them quickly before the ad runs out. Facebook specifies that you should use images with 1080 x 1920 resolution and a 9:16 aspect ratio. If you use video instead, keep in mind that you aren’t allowed to use any supporting sales copy, titles, etc. Your video needs to be 100% self explanatory. Once again, make sure that customers know who you are, what you do and how you can help them. The videos cannot run for longer than 15 seconds (you cannot crop after uploading) and have be at least 720p resolution. They must be in .MOV, .MP4 or .GIF format and less than 2.3GB in size. If you only have videos in other formats, you’ll need to convert them first. 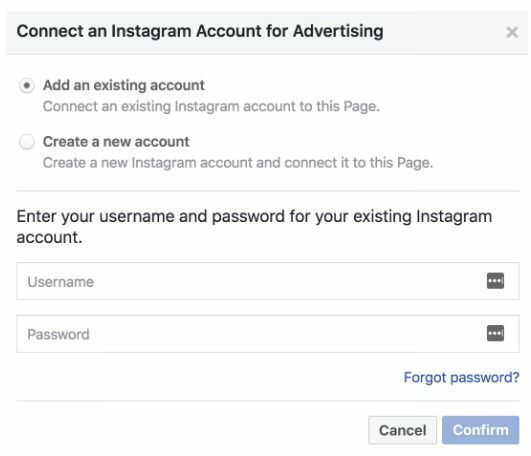 If you’ve never run Instagram Ads before, you’ll probably have to start by connecting your account to your Facebook page. If you’ve already done this, just skip ahead to the next section below. 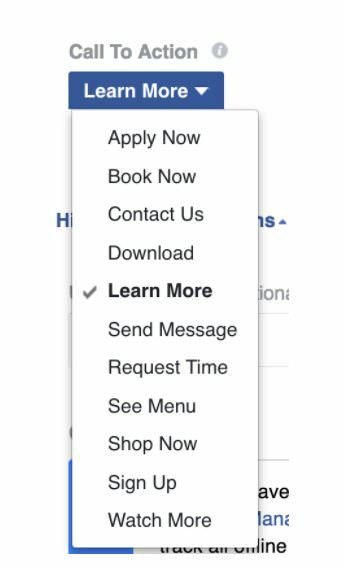 First, navigate to your Facebook Business Page. Then, click on the blue “Add Account” button. Log in to your Instagram account, or create a new account if you don’t have one. Then, click on the “Confirm” button. And you’re set! 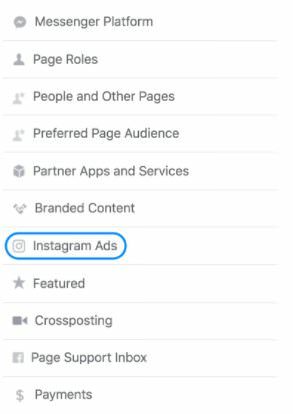 You can now create Instagram Stories Ads for your business! Once your account is set up, it’s time to create your ad. 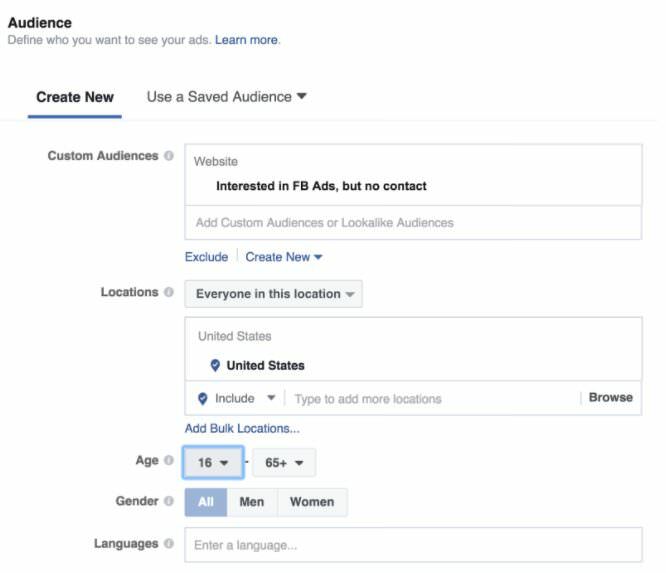 It’s worth mentioning that you can also create these ads in the Facebook Power Editor, but for this guide we’re going to focus on creating them through the standard Facebook Ads Manager. For the most part, creating an Instagram Stories Ad is like creating any other Facebook ad. Step 2: Then, select your objective. For Instagram Stories, you’re limited to one of five objectives: Reach, Video Views, Traffic, Conversions, and App Installs. Step 4: Set up your objective parameters. This part will be a little different depending on your choice in step 2. But they’re all pretty self-explanatory. Here I’ve set my goal to get the most traffic to my website. Step 8: Set up your budget and schedule. Step 9: Select what page will represent the advertisement. This will be the name that people see while your ad is playing. You can either use one of your Facebook pages or Instagram account. Step 10: Select the Ad Format. 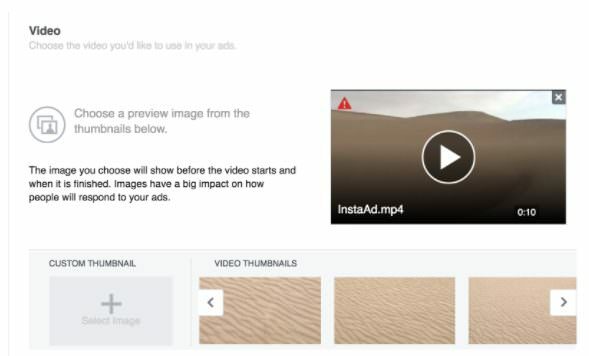 If you select photo, you’ll be able to create up to 6 different ads with one photo each. You can only create one video ad at a time. Step 11: Upload your media. This section may look different based on your choice in step 2. Since we’re targeting website traffic, we’ll track success by people that visit our Instagram Ads landing page. Step 13: Define your Call to Action. You can select from a list of triggers to encourage users to swipe up and engage with you. Step 14: Review your order at the bottom and make sure everything looks good. Step 15: Place your order! 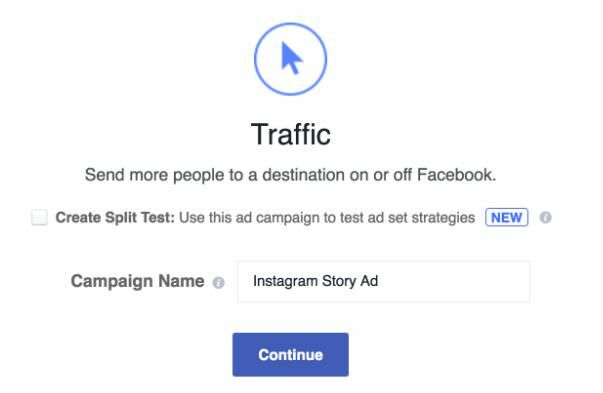 Your ads will be set up and start appearing between users’ Instagram Stories shortly. Launching a new product? Breaking into a new market? 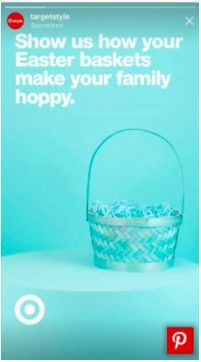 These ads provide a great way to quickly introduce your product to potential customers. You don’t need to reinvent the wheel for every media format. If your company has a special event or sale coming up, let your customers know! With the introduction of calls-to-action, you can now have customers swipe up and jump straight to your store. Prompt users to create and share their own content by starting an online dialogue with them. Ask them a question, throw down a challenge – anything to get them talking and sharing your brand with their followers. Another angle is to prompt your users to open a live Facebook chat with you. This could be especially useful for companies that offer consulting services or sell big-ticket products that require a sales call. Company not staffed with an army of sales reps? Consider using a Facebook Messenger Chatbot to schedule sales calls or collect their contact information. Helping a charity? Broke a world record? Made a killer collaboration? Build your brand’s image by preparing a quick video highlight real. Show how your brand is impacting the world and build a lifestyle image for yourself. 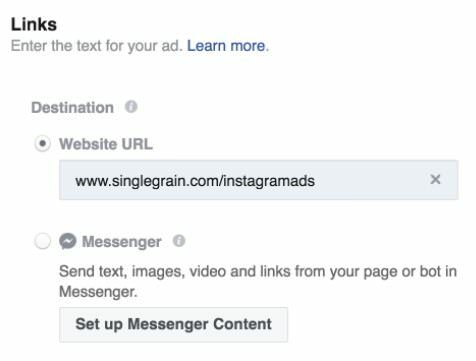 Since Instagram is linked up with Facebook, you can even use these ads to set up retargeting campaigns based on behavior tracked with your Facebook Pixel. Retargeting is a key way for online sellers and service providers to boost marketing ROI and you shouldn’t leave Instagram out of that equation. Instagram’s new ad format gives you a new way to connect with potential customers. It’s one of the few formats that gives you the audience’s complete attention and comes fully equipped with Facebook’s mountain of demographic data. 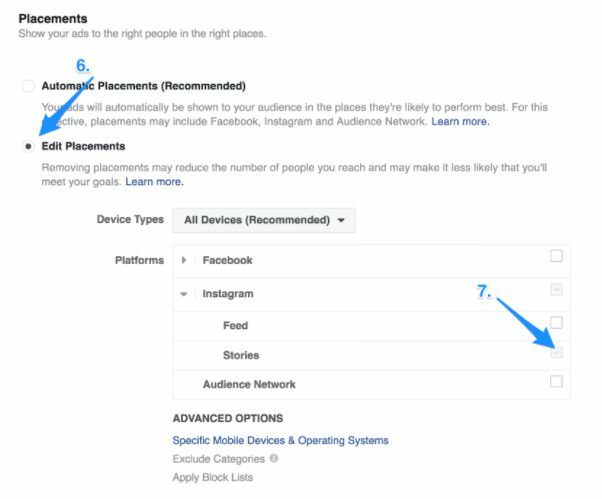 You can also manage these new ads like any other Facebook or Instagram campaign from the same dashboard, making it easy to adopt and stay on top of.